:This class is the perfect place to start if you don’t know anything about yoga. Learn proper alignment, modifications and options of foundational poses and vinyasas. You will learn breathing techniques & mudras. Breakdown of poses demonstrated to help you ease into Level 1! This basic flow class is appropriate for practitioners of all levels. Well rounded class structure helps to build strength and flexibility while needed modifications are given to students of different levels to insure safe and enjoyable practice. Basic meditations and breathing techniques are introduced through out the class to enhance relaxation. Everybody is welcome! Vinyasa Flow- This style of yoga is great for building energy. The breath is used to guide students from one pose to the next. Intensity varies between different types of flows. This class is “4 All Bodies” and focuses on gentle yoga postures combining with somatic movements to calm the mind, tune the body, and encourages students to find comfort and ease to live better in their bodies. The somatic movements provides slow and steady exploration of foundational postures and somatic awareness with emphasis on coordinating breath with movement helping to release tension, increase mobility and create new brain pathways. The practice format affords students the opportunity to strengthen and tone the muscles, the immune system, improve flexibility and balance while reducing stress and anxiety. Getting back to traditional yoga by practicing Akhanda Yoga. In Indian "Akhanda" means whole and indivisible. Akhanda Yoga include asana, pranayama, cleansing kriyals, Ayurveda, Vedic chanting and meditation. 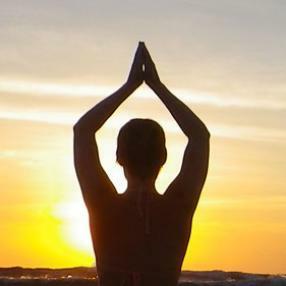 This holistic yoga give us the tools to good habits for a healthy lifestyle. Come relax, rejuvenate, and replenish with our weekly Reiki Share! Reiki is a spiritual healing art with roots from Japan. The word Reiki comes from the Japanese word (Rei) which means “Universal Life” and (Ki) which means “Energy”. Reiki can help ease tension and stress and can help support the body to heal on all levels – physical, mental, and emotional. A Reiki Share is a gathering of practitioners to exchange this healing energy with themselves and others. All levels of Reiki practitioners are welcome to join, as well as those with no Reiki experience. Each person will have a turn to receive. This ongoing class is free of charge. Love offerings and donations are greatly appreciated.